The Syrian Observatory for Human Rights said it received information from top IS leaders confirming his death. THE US GENERAL who heads the coalition fighting the Islamic State group said today he had no information that would confirm or deny claims the jihadists’ leader Abu Bakr al-Baghdadi is dead. Lieutenant General Stephen Townsend said he had heard “all kinds of reporting” about Baghdadi’s status. “I don’t have a clue,” Townsend said in a video call from Baghdad. Hope he’s deader than a doornail. And if he’s not, as soon as we find out where he is he will be. 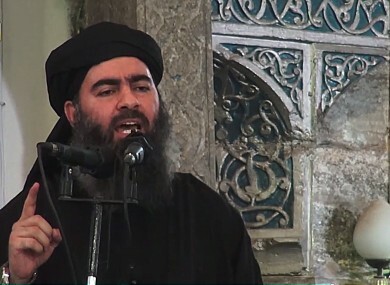 The Syrian Observatory for Human Rights, a longtime monitor of the country’s conflict, said earlier today it had information from top IS leaders confirming Baghdadi’s death. But if confirmed, his death would mark another devastating blow to the jihadist group after its loss of Mosul, which Iraqi Prime Minister Haider al-Abadi said yesterday had been retaken from IS after a gruelling months-long campaign. Email “US general says he hopes ISIS leader is 'deader than a doornail' but cannot confirm death”. Feedback on “US general says he hopes ISIS leader is 'deader than a doornail' but cannot confirm death”.